One of my favourite restaurants in Edmonton, Corso 32, used to have a fava bean crostini on their menu that was to die for. It's the kind of thing that would keep you going back even if that were the only thing on the menu, which, luckily, it isn't. This is my take on that recipe since fava beans are not always the easiest things to find. 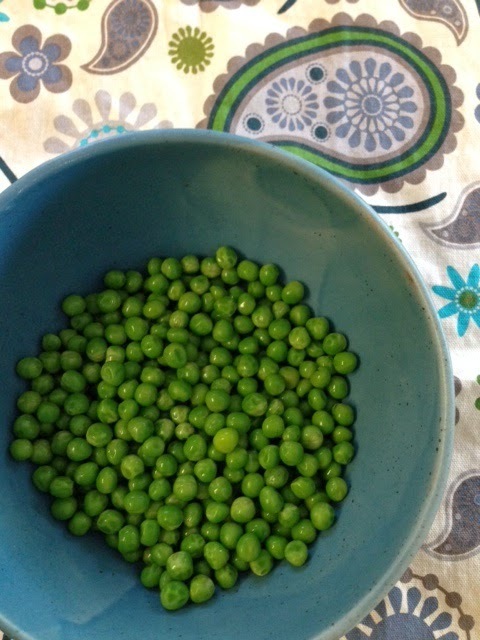 It may not be the time of year for fresh peas from the garden, but the sun is out, and it is almost time to start putting those pea seeds in the ground, so I thought that was good enough. This recipe is almost as good with thawed frozen peas, so why not? If you have a day-old baguette, slice it into thin rounds, brush with extra-virgin olive oil, and bake at 350 degrees Fahrenheit until brown and crispy. When they come out of the oven, rub a piece of raw garlic over the toast. If you don't have a baguette, just use crostini from the store. 1. Toast the pine nuts in a dry pan on the stove or on a baking sheet in the oven for a couple of minutes, being very careful not to burn them (I always do!). 2. In a food processor, combine the peas, olive oil, parmesan, basil, and lemon juice until smooth. 3. Season the pea puree with salt and pepper to taste. 4. 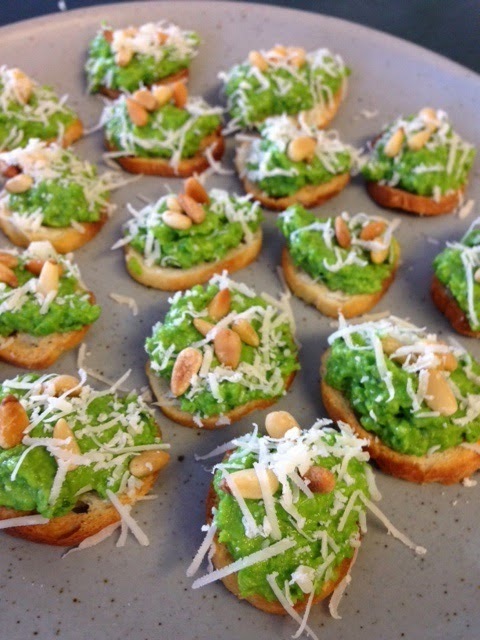 On top of each crostini, put a spoonful of pea puree, a few pine nuts, and some grated parmesan cheese. Enjoy! 1. The best, but most expensive, kind of parmesan cheese is parmegiano reggiano. Do NOT use the parmesan that comes in the green can from the pasta aisle. I'm not sure what that stuff is, but it is not cheese. 2. I use sweetlet or summer sweet peas for this recipe. They are smaller and sweeter and have a more tender texture that the large green peas. 3. Pine nuts are expensive and go rancid quickly, so I keep them in the fridge. The pea puree will keep in the fridge for several days, so it is really easy to make ahead of time - just don't put it on the toast until the last minute! If you close your eyes when you eat them, you can almost imagine the snow is gone!